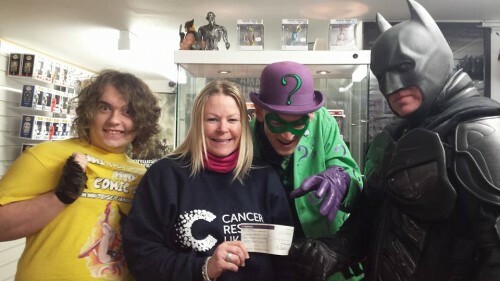 The first ever Whitby Sci Fi & Comic Con took place last November (you can catch all of our coverage by clicking here) with all profits going to Cancer Research UK, and this weekend organisers Adrian and Jack Booth handed over the cheque to CRUK’s local area representative Rachel. 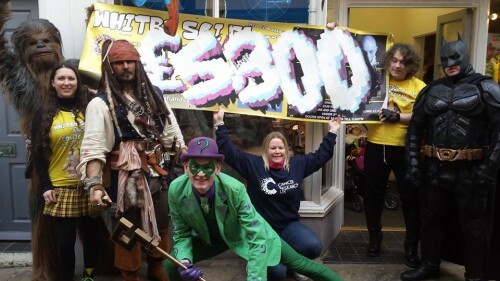 The handover took place outside Adrian and Jack’s shop Outpost 31 in Whitby, and with the help of Batman, Jack Sparrow, Chewbacca and a few other’s, the WSFCC team presented a cheque for £5,300. The thanks of the Whitby Sci-Fi & Comic-Con team and myself go out to everyone who supported the event which was inspired by Adrian’s wife Sharon who sadly passed away last summer. Plans are already well under way for the second Whitby Sci Fi Comic Con which will be held on November 19th 2016.